More from John Lardner. Originally published in 1949 in the New Yorker and reprinted here with permission of Susan Lardner. Hell’s Kitchen, the region west of Eighth Avenue around the Forties, won its name many years ago and continued to deserve it until about the time the Eighteenth Amendment was repealed. Things are different there now. So its residents will tell you, and so you can see for yourself if, having known the neighborhood a little during Prohibition, you visit it even briefly today. Once it was carpeted, for nearly all its length and breadth, with low, swarthy brick tenement houses containing a warren of flats, speak-easies, six-table cellar “cabarets,” hole-in-the-wall stores and restaurants, back-room stills, and “social clubs,” where a portion of the manhood of the district stored guns and ammunition and planned stick-ups and highjackings. Right along the equator of Hell’s Kitchen ran the Ninth Avenue “L” tracks, throwing a grim, significant shadow by day and night. Other parts of town had clip joints, or “buckets of blood,” scattered through them, but the Kitchen, as a detective friend of mine used to say, was one big bucket of blood. Nowadays the Kitchen is a bit more shiny and much more respectable. Neon lights and modern shops and garages have pushed their way into it. The McGraw-Hill Building has gouged out half of what was considered one of the hottest blocks in Hell’s Kitchen in the nineteen twenties—the block bounded by Eighth and Ninth Avenues and Forty-first and Forty-second streets. The Lincoln Tunnel approaches have formed an asphalt plaza west of Ninth Avenue. The sleek New Jersey buses and automobiles bound for and away from the West Side Highway plow across the old badlands in steady procession. The retail liquor traffic thereabouts has become negligible; the city’s center of gravity of crime has shifted elsewhere, perhaps to Brooklyn. Broadly speaking, Hell’s Kitchen is not a frontier community any more but a sort of vehicular gateway to the heart of Manhattan. However, if you want to conjure up the atmosphere of earlier times, you can still find islands of squat tenement houses here and there to help you, many of them boarded up and condemned, and the empty shells of many basement grogshops. In the unlikely event that you want to visit the scene of the murder, twenty-four years ago, of a man called Battling Siki, which is what I did one day recently for no useful reason, you will come across a few surviving landmarks. You can pace off distances in the same gutter and seamy street—Forty-first—down which Siki crawled forty feet west toward Ninth Avenue, with two bullets in his body, before he collapsed and died. He crawled in the direction of the “L,” the cave of shadows that no longer is there. His killer threw away the gun in front of a grimy old house that is now gone; the McGraw-Hill Building is there instead. These changes make the setting less sinister than it used to be, but even now there’s plenty to show that it was a drab and lonesome place to die. It strikes me that tributes paid by civilized people to a “natural man,” especially one who has walked among us, are apt to sound either patronizing, like the World’s, or uneasy, like some delivered by American correspondents when Siki won his boxing championship in Paris in 1922 and was first interviewed. After praising Siki’s strength and simplicity, one reporter wrote apprehensively, “He is very black and very ugly.” Siki’s manager at the time, a M. Hellers, was quoted as saying that Siki was a fine lad but “just a little bit crazy.” I can discover no support among those who were acquainted with Siki in America later on for the idea that he was crazy, except when he drank, or the idea that he was mentally toadlike. He was illiterate, never having been to school, but he could make himself understood in several languages including English, French, Spanish, Dutch, and German. As far as Candide is concerned, Siki resembled Voltaire’s hero in that he had a sheltered boyhood, was thrown suddenly into the thick of the best of all possible worlds, and found society both violent and larcenous. At seventeen, he was involved in a civilized world war. At twenty-five, he was permitted to box a champion on the condition that he lose the match. Having ignored the condition and won the championship, he insured his loss of that title, in all innocence, by fighting an Irishman in Dublin on St. Patrick’s Day. He entered American life in the heyday of the Volstead act. He could not master the strong waters or the social customs of the West Side of New York City. He was killed by gunfire, after surviving a stabbing earlier in the same year. It may seem, offhand, that Hell’s Kitchen was a curious place for the curtain to fall on a twenty-eight-year-old Mohammedan born in St. Louis de Senegal on the fringe of the Sahara Desert, but Voltaire has shown that when civilization gets its hands on one of these natural men, it pushes him about at random from curious place to curious place. Candide was lucky to wind up safely cultivating his garden. He came close to meeting his end in an auto-da-fé in Portugal and, another time, on a roasting spit in Paraguay. Siki’s story is perhaps more realistic. He failed to last out the course. The newspaper writers of the 1920s were merely being wishful when they called Siki a jungle child. St. Louis, his African home, is a seaport ten miles above the mouth of the Senegal River, on a bare plain that marks the Sahara’s southwesternmost edge. It’s doubtful whether anyone in Europe or America today knows what Siki’s real name was. Legend has it that when he was ten or twelve years old, a French actress touring the colonies saw him in St. Louis, was impressed by his appearance, and took him into her personal service, giving him, for reasons based on classical Greek, the name of Louis Phal. Whatever its origin, this, Anglicized as Louis Fall, was his legal name when he was married, and when he was murdered, in America. 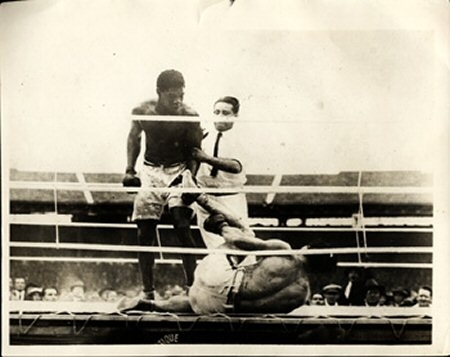 He did not become known as Battling Siki until he began to box professionally, in 1913; apparently the word “Siki” was coined or borrowed by French fight promoters, to whom it had vague “native” or colonial connotations. The tale about the actress was told widely in Paris in the days of Siki’s first fame, when he knocked out the celebrated Georges Carpentier, but it was never, so far as I know, closely checked up on. It accounts, plausibly enough, for the abrupt shift of Siki from dusty African streets to the perils of Western civilization. The lady is said to have taken him to her villa on the French Riviera and dressed him in a page boy’s uniform of bottle green. Subsequently, he worked in one town and another as a bus boy. He was fifteen when he started boxing. Siki had just time for a handful of fights, most of which he won, before the war of 1914-18 broke out and he was conscripted into the 8th Colonial Infantry Regiment of the French Army. His war record was distinguished; in fact, he is reported to have been the bravest soldier in his outfit which saw action on several fronts and gave a strong performance generally. For heroism under fire, Siki won not only the Croix de Guerre but the Médaille Militaire. After demobilization, he could have had his choice of a variety of ordinary civilian jobs; his record guaranteed him that. However, he went back to the prize ring, where the rewards were intermittent but came in good-sized pieces when they came. He barnstormed in France, North Africa, Spain, Belgium, and Holland. From a tour of Holland in 1921 he returned to Paris, where he lived with a Dutch girl who was thought to be his wife and by whom he later had a child. Siki did not work especially hard at his trade. He fought once or twice a month, which is not often for a “club,” or journeyman, fighter, and, while he usually won, he beat nobody of major importance. Between bouts he drank more absinthe than is normal in the profession. American critics were to speak of him three or four years later as a fighter of considerable natural ability who might have been much better than he was. Weighing about a hundred and seventy-five pounds, the maximum for light heavyweights, and standing five feet eleven inches tall, he was a well-muscled young man with a leaping, bounding, lunging style from which he got slapstick effects that amused the galleries, and himself as well. In the early months of 1922, he happened to defeat a couple of men of some slight reputation and thus came to the notice of François Descamps, then the most influential and artful character in French boxing. Descamps offered him a bout for the world’s light-heavyweight championship with Carpentier, whom Descamps managed. The prizefight business in Continental Europe in those days was an odd blend of laissez faire and team play—laissez faire being understood to mean “Let Descamps do it his way,” and “team play” to mean that all hands share in the spoils. Descamps owned a large stable of fighters and also, it was commonly believed in Paris, a large stable of sports writers. Some of the latter were growing restive in 1922, possibly because of a failure in the team-play system as administered by Descamps. When the Carpentier-Siki match was announced, certain journalists expressed a distrust of it. They suggested that, in Siki, Descamps had laid hold of a small-time, happy-go-lucky trouper with no ambitions beyond getting all the absinthe he could consume, who would be glad to bolster Carpentier’s fortunes—Carpentier had not fought for really big money since his knockout by Jack Dempsey in New Jersey, fourteen months before—without making too much trouble for the champion in the ring. Their hints were undoubtedly read by the public. Carpentier was a war hero, the toast of the boulevards, a boxer still regarded, in spite of his defeat by Dempsey, as peerless in Europe, but though the crowd of 55,000 that came to the new Buffalo Velodrome in Paris on the afternoon of September 24, 1922, to see him fight Siki was the largest in European boxing history, it showed before the day was over that it was on the alert for signs of skulduggery. Its suspicions were inflamed during the preliminary bouts by the work of Harry Bernstein, a referee charged by sports writers with occupying a special compartment in the hip pocket of M. Descamps. In one preliminary, the opponent of a Descamps featherweight named Fritsch was disqualified by Bernstein for hitting too low; in another, the opponent of a Descamps heavyweight named Ledoux was disqualified by Bernstein for not fighting hard enough. Bernstein’s rulings brought a volley of coups de sifflet from the customers, particularly those in the seven-franc seats, who had mustered their sous at a sacrifice and wished for their money’s worth of equality and justice. The main bout was scheduled for twenty rounds. Carpentier, pale and blond, weighed 173 1/2 pounds, Siki 174. In the first round, Siki fought cautiously and less acrobatically than usual; Carpentier jabbed at him with his left hand. Once, hit lightly, Siki dropped to one knee; Bernstein, who was refereeing this bout, too, did not bother to count. “Get up, Siki, you’re not hurt,” he said. After the round, ringside spectators saw Carpentier smile broadly and heard him say, “I’ll get him whenever I want to.” The champion, boxing easily, won the first two rounds. In the third, Carpentier sent a right-hand blow to Siki’s jaw, and Siki dropped to his knee again, this time taking a count of seven. When he got up, he rushed at Carpentier and hit him violently in the body with a left and a right. Carpentier, looking startled as well as hurt, went down for four seconds. The rest of the fight was all Siki’s. Siki battered Carpentier about the ring in the fourth round while Carpentier hung on to Siki’s arms whenever he could and tried to pinion them with his own. In the fifth, Carpentier fell against the ropes. Siki leaned over him (“I whispered to him to quit,” Siki said later), and Carpentier, pushing himself up, butted angrily at Siki’s belly. Carpentier could hardly stand when the sixth round began. Siki hit him at will. A right uppercut followed by a shower of right and left swings sent Carpentier to the floor unconscious one minute and ten seconds after the start of the round. As he fell, one of his feet became tangled between Siki’s, assisting the fall. It was plain that Carpentier was completely knocked out, but at that point Bernstein ruled that Siki had lost the fight by tripping his opponent illegally. The third disqualification of the day was more than the crowd was prepared to stomach. It pushed its way to the ring from all quarters of the stadium and stormed around it, yelling furiously. Police were called up to protect Bernstein. Descamps, meanwhile, for whose blood the demonstrators were also shouting, slipped out of the arena behind a couple of gendarmes. Three judges—Victor Breyer, Jean Pujol, and an Englishman, Tom Bannison—who, before the fight, had been appointed by the French Boxing Federation to make a decision in case there was no knockout were now appealed to. After conferring briefly with Federation officials, they announced that they would give a final and formal verdict either supporting or overruling Bernstein’s. They deliberated for three quarters of an hour while Bernstein stood in one comer of the ring among his police guards and practically no one in the audience went home, or even stopped talking unkindly to the referee. The judges, willingly or not, at last did what the crowd wanted: they declared Siki the winner by a knockout and, in the name of the Federation, awarded him the light-heavyweight championship of the world, plus a subsidiary title of Carpentier’s—the heavyweight championship of Europe. Siki said to Hellers, his manager, “Tell America I am ready for Dempsey,” and repaired in triumph to his dressing room. The crowd disbanded. The police saw Bernstein safely to the door of his dressing room. Siki never got a match with Dempsey, but some offers of lesser opportunities did come to him from America. He was lavishly feted in Pans during the first two days after his victory, and after public enthusiasm subsided, his own continued to run high, especially in the Montmartre neighborhood. “No more absinthe. 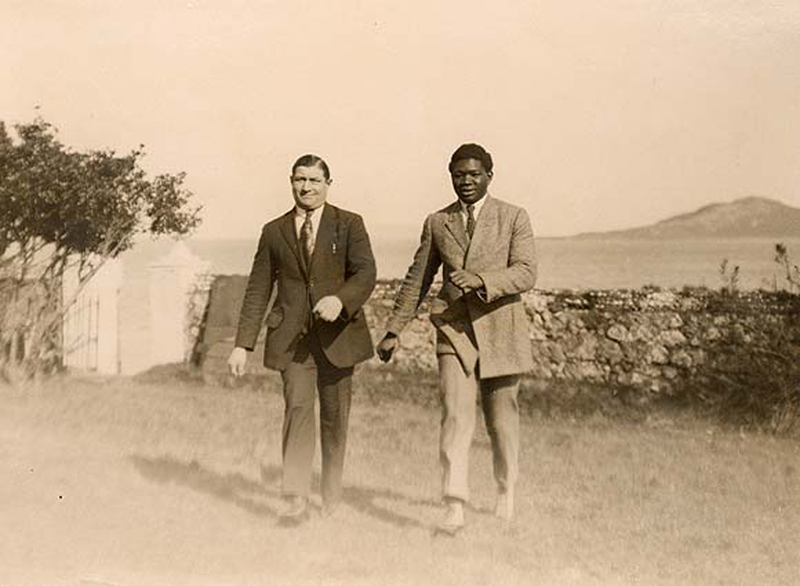 I will train and fight hard as champion,” Siki had told a gathering outside the office of the newspaper Echo des Sports on the twenty-fifth, the day following the fight. Later that evening, he took a few glasses of champagne, and on touring Montmartre in a rented car with a chauffeur, he reverted to absinthe wholeheartedly at every stop he made. After another week or so he acquired, probably as gifts from fellow colonials, a monkey, which he carried everywhere on his shoulder, and a lion cub, which he led about on a leash. Carpentier was still lying in bed suffering from a sprained ankle, two broken hands, and an unsightly swelling of his nose and lips. Most of the Parisian sporting press was sympathetic toward him but nastily jubilant about Descamps, who, it was implied, had overreached himself and been double-crossed. Rumors to the same effect circulated through Paris for the next several weeks. In early December, the French Boxing Federation precipitated the publication of what was very likely the true story of the fight by suspending Siki—it was charged that while seconding another fighter in the ring, he had struck the manager of his man’s opponent. Siki, deprived of a chance to make a living in France, went for help to M. Diagne, the representative for Senegal in the French Chamber of Deputies. Diagne asserted before the Chamber that the Boxing Federation was discriminating against colonials in favor of Parisian city slickers who wanted Siki out of the way, and in support of this theory he gave the deputies the account of the Carpentier bout that Siki had given him. When the Chamber appeared unwilling to take any action, Diagne called a press conference and had Siki repeat his story to reporters. It ran as follows: A fix had been arranged fifteen days before the bout took place, with Descamps dictating procedure to Siki’s manager. As a sign of good faith, Siki was to take a short count in the first round and another count in the third. He was to get himself knocked out early in the fourth. Siki followed the scenario through the third-round knockdown—”I stayed down for seven the first time Carpentier hit me hard enough to give me an excuse,” he said—but as he knelt on the floor at that point, he decided not to go through with the frameup. It was his pride, he said, and his loyalty to the public that made him change his mind. When he got up, he began to fight in earnest. He ignored a sharp reminder from his manager, between the third and fourth rounds, that his end was expected momentarily. (This detail in Siki’s narrative gave Hellers a clean bill of health, in a left-handed way; Descamps had been so suspicious of treachery by Hellers that he quarreled with him in public after the bout.) Siki surprised Carpentier with his counterattack and soon demolished him. When Siki’s story was done, M. Diagne explained to the press what it meant: A simple, uneducated man had defended himself and all underprivileged peoples against exploitation by a predatory society. Siki, who was always emotional, wept freely at these words. His tears and his deputy’s arguments got him nowhere. Neither did a court of inquiry appointed by the Boxing Federation to investigate Siki’s statement. The court, with a flashy display of ingenuity, hired two deaf-mutes to watch the motion pictures of the fight and see if they could lip-read certain remarks delivered excitedly by Descamps to Hellers in Siki’s corner during “a critical phase of the battle,” after Siki had begun to knock Carpentier around. The experiment (unique, I think, in boxing history) was later described by the court as “successful,” but Siki remained suspended. He never fought in France again until after he had lost his championships elsewhere. My own opinion is that being champion constituted Siki’s chief sin in the eyes of the Federation. Also, I believe his story of the Carpentier match was substantially correct. A “sign of good faith”—a preliminary fall, or lapse of some other kind, by the loser—is a standard device in the plotting of sports frameups. Eddie Cicotte, a Chicago baseball player, hit the first batter he faced with a pitched ball in the crooked World Series of 1919, as a signal to gamblers that the fix was in. Siki’s tale confirmed the rumors that were current before and after the fight; it was in keeping with the character of Descamps and of Continental boxing methods in 1922, and it is believed by every European and American I know who was familiar in any degree with the time, the place, and the actors. As it turned out, the Carpentier bout was the only one of importance in Siki’s professional career, except for the next one. The next one was weak and anticlimactic as a show, but it did involve a world’s championship, and it demonstrated in a special way how complicated the civilization of the West can be for an unlettered Moslem with no grounding in our rituals and customs. A fairly good light heavyweight from County Clare in Ireland named Michael Francis McTigue happened to pass through Paris with his staff during Siki’s suspension. Finding Siki idle and nearly broke, the visitors proposed a match between him and McTigue for the title. (The world’s light-heavyweight championship was the one that interested them; the heavyweight championship of Europe had no value in the world market, and has been recognized only sporadically since the day Carpentier lost it.) They spoke of Dublin as a pleasant spot for the Siki-McTigue bout. They mentioned March 17, 1923, as an open date in their engagement book. Siki fell in with these suggestions and met McTigue in the ring in the Irish capital on Saint Patrick’s Day. The operation for the removal of his crown was painless. The decision went to McTigue on points. There was nothing particularly wrong with this verdict, I am told by a neutral eyewitness, except that McTigue did not make the efforts or take the risks that are commonly expected of a challenger for a world’s championship. There was no need to. In the circumstances, nothing less than a knockout could have beaten him, and he avoided that possibility by boxing at long range throughout. One device by which a civilized man can avoid a predicament like Siki’s in Dublin was illustrated by McTigue himself later in the same year. He went to Columbus, Georgia, to fight a Georgian named Young Stribling before a crowd that was strongly and ostentatiously in favor of his opponent. There was almost no way McTigue could avoid losing within the Georgia state limits, so, to protect his planetary interests, he took along a referee from the North. The referee called the bout a draw. Then, yielding to the howls of protest, he announced that he would deputize the local promoter to give the decision. The promoter called Stribling the winner. The referee, on his way back North by train with McTigue and McTigue’s manager, signed an affidavit that his own true and considered verdict was for a draw. That is how the result has been listed in the record books ever since. 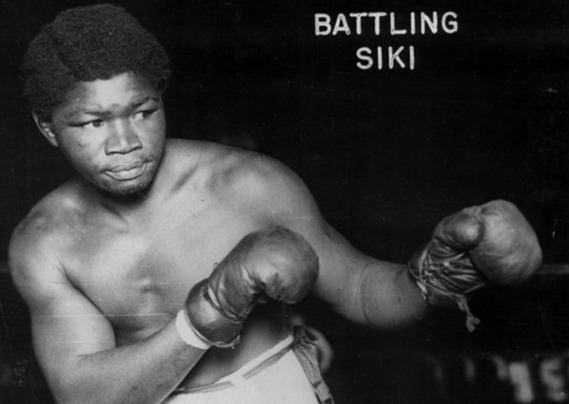 Siki had only two more European fights, both in Paris, after he lost his titles. The last two years of his life he spent in America, disintegrating with headlong speed on bootleg gin and whiskey but nearly always able to make money in the ring when he needed it. When he first arrived in New York, in September 1923, his name had a certain value here, based on curiosity, which it no longer had abroad. He signed on with the stable of a veteran New York manager, Robert (Pa) Levy (Hellers appears to have discarded Siki at the time of his suspension in France), and his first fight in this country was a serious one with a respectable opponent, Kid Norfolk, who beat him in fifteen rounds at Madison Square Garden. From then on, American fight fans were not disposed to think of Siki as a boxer of the top rank, but they liked to watch him. His style was eccentric and funny. He was strong and fast enough to knock out most of the palookas he met, when he felt like it. He was booked as far west as California and as far south as New Orleans, and he earned, according to a fairly reliable estimate I have heard, nearly a hundred thousand dollars between November 1923 and November 1925. He was one of the best spenders, in proportion to income, that the United States has ever seen. In restaurants and speakeasies he sometimes tipped five or ten times the amount of the check. Once, having made five thousand dollars from a fight in New York on a Friday, he was turned out of his rooming house the following Monday for nonpayment of rent. Another time he gave away all the money in his pockets to passengers on a Lackawanna Railroad ferryboat on which he was returning from a fight in New Jersey. Scolded for this by his manager, Siki wept. Most of his cash, however, continued to be spent on gifts, liquor, and clothes. In clothes, Siki’s taste was unusual but rich. In the first part of his New York residence, when he lived and roamed mainly in the Times Square area, he almost always wore full dress when he went out at night. By day, ordinarily, he appeared in a high hat, a frock coat, red ascot tie, striped trousers, spatted shoes, and a monocle, and he carried a gold-headed cane. From time to time he gave away all the stylish clothes he had on and went home by cab in his underwear. He was particularly open-handed with his high hats. One of these, Siki’s gift to the management, hung on a peg in a West Side saloon I used to visit until a few years ago, when the place closed up. Siki’s New York life was divided into two roughly equal periods, the second of which he passed largely in Hell’s Kitchen. He had been married in the summer of 1924, at the Municipal Building, to a woman from Memphis named Lillian Werner. The event attracted just enough attention to stimulate newspaper inquiries in Paris, where neighbors of the Dutch girl with whom he had lived in the suburb of Lanves said she was still there and was still thought to be his wife. She herself was not interviewed or quoted to that effect then or afterward, so far as I know. Siki and his American bride moved into a flat at 361 West Forty-second Street early in 1925. Siki had begun to go downhill physically and professionally by then. His bookings for fights were fewer than they had been, and he did not fulfill all those he made. He got into trouble, almost simultaneously, with the United States Immigration Service and the boxing commissioners of New York State. Siki had come to America on a short-term permit. In July 1925 he was arrested for felonious assault after slashing at a policeman with a knife, at which the Government began deportation proceedings. In August the Boxing Commission, annoyed by a facetious exhibition Siki had given at a small New York Cityfight club, summoned him and Levy to its office, suspended Siki, and told Levy to make sure that the fighter was somewhere beyond the three-mile limit within thirty days. The order may seem to have been a usurpation of Federal powers, but it coincided with the Government’s view. At this point, France told the United States that it would refuse to receive Siki if he were deported. Siki, who had wept in the Boxing Commission office when he heard the order to his manager, now took advantage of the stalemate and, in November, filed application for his first citizenship papers. Government decision on his deportation case was still pending when he died. Siki had the reputation in Hell’s Kitchen in 1925 of being dangerous when drunk, mild and affable when sober. As he drank more heavily and fought less in the ring, he fought more in the street, and his opponents were a rough and active group of men. He was known for his favorite joke of hailing a cab, taking a ride, and then challenging the driver to fight for the fare. Occasionally, too, he would invade the Times Square station of the I.R.T. in the early morning in search of amateur boxing engagements. It is characteristic of many boxers that as they lose their ability in the ring they swing their fists more frequently outside it, as a sort of blurred insistence on the claim that they are as good as ever. That, along with the drinks Siki bought or charged up in the bars of the West Side, may account for his pugnacity in his last months. The only instance of Siki’s using a knife that I have found was the time he was arrested for drawing one on a policeman. His wife went to night court to plead for him on that occasion. She made a good impression and got him off with a five-dollar fine. Though he was stabbed in the back himself in August, not long after he had smashed up a speak-easy in the West Forties and spent a few days in the French Hospital on West Thirtieth Street as a consequence, Siki went on using his fists—and now and then a piece of furniture—in nearly all his brawls. He was fined another five dollars on December 6 for slapping a patrolman at the corner of Seventh Avenue and Thirty-fourth Street. At about seven o’clock in the evening on Monday, December 14, Siki’s wife met him on the stairs to their flat on West Forty-second Street. The house they lived in still stands, a house of dingy brick with ten walk-up apartments, two on each of its five floors. Siki told Mrs. Siki he was going “out with the boys” and would be back in time to help her pack for a trip they were making next day to Washington, where Siki was to appear in a theater. Shortly after midnight on the morning of the fifteenth, Patrolman John J. Meehan, of the West Thirtieth Street station, walking his beat along Ninth Avenue, had a brief encounter with Siki, whom he knew by sight. Siki, wobbling a little as he turned under the “L” tracks from Forty-first Street, called to Meehan that he was on his way home. The patrolman told him to keep going that way. At 4:15 A.M., Meehan walked past the intersection of Forty-first Street and Ninth Avenue again and saw a body lying about a hundred feet east of the corner in the gutter in front of 350 West Forty-first. Approaching it, he recognized Siki. The body was taken to Meehan’s station house where a doctor pronounced the fighter recently dead from internal hemorrhage caused by two bullet wounds. Detectives examined the deserted block of Forty-first between Eighth and Ninth avenues. In front of No. 346, some forty feet east of where Siki had died, they found a pool of blood on the sidewalk. It seemed to them that Siki might have been trying to crawl home after he was shot. They could not tell just where the shooting had taken place. The gun, a vest-pocket .32-caliber pistol, was lying in front of No. 333, on the other side of the street. Only two bullets had been fired from it. An autopsy showed that these had entered Siki from behind, one penetrating his left lung and the other his kidneys. The autopsy showed something else which surprised Siki’s neighbors a good deal when they heard of it: he had suffered from an anemic condition. At his wife’s request; Siki was given a Christian funeral service at the Harlem funeral parlors of Effie A. Miller. The Reverend Adam Clayton Powell delivered a eulogy. However, seven Mohammedan pallbearers in turbans carried his body to the hearse, chanting prayers as they did so, while a crowd of three thousand people looked on. The body was clothed in evening dress, as Siki would undoubtedly have wished. His estate, estimated at six hundred dollars, was awarded to his wife in Surrogate’s Court after Levy made out an affidavit in her favor. The words of the affidavit while perhaps not strictly accurate in point of fact told the broad truth about Siki’s place in the world better, I think, than the editorial that spoke of Achilles, Siegfried, and “natural man.” To the best of his knowledge, Levy said, Siki left surviving “no child or children, no father, mother, brother, or sister, or child or children of a deceased brother or sister.” He lived as a man without kin or country, roots or guides, and that, it seems to me, is a hard way to do it. Siki’s murder was never solved. There was an abundance of suspects, but none of them suited the police at all until one day in March 1926 a young man of eighteen who lived a block or two from Siki’s house was arrested and booked on a homicide charge in connection with the killing. Detectives disguised as truck drivers had heard him making incriminating remarks, they said, over a telephone in a bootleggers’ hangout at Tenth Avenue and Fortieth Street. On being arrested, he allegedly signed two statements which gave two different accounts of the crime. One said that Siki had staggered into a coffee pot at Eighth Avenue and Fortieth Street in the early morning of December 15 and had thrown a chair at the eight men, including the deponent, who were gathered there. Deponent ran out of the place in alarm and heard shots fired in the restaurant behind him. The other statement, which fitted the physical facts of the killing a little better, said that a short while after the throwing of the chair, he, the young man under arrest, lured Siki to Eighth Avenue and Forty-first Street on the promise of buying him a drink. At the corner they were joined by two other men, one of whom, as the party walked west on Forty-first, shot Siki in the back. The young man was held in the Tombs for eight months, until the fall of 1926, and then was released by the court without trial, presumably because the state was not satisfied with its case. I might add that in May 1927 this same young man got five to ten years for second-degree robbery, committed in April in the vicinity of Ninth Avenue and Forty-second Street against a tourist from another state. That was clearly the wrong part of town for a tourist to go to. Please keep the John Lardner coming. I've often told people that John Lardner was the best sportswriter who ever lived and they try to correct me by saying, "You mean RING Lardner." And then you say, "No, I mean JOHN Lardner." My pleasure. He was terrific. I've read all of Lardner's books and have gone through the New Yorker and Newsweek archives to read more of his uncollected stuff. I think Red Smith's obituary collection "To Absent Friends" is the closest in tone to Lardner's work but as good as that collection is, it was missing Lardner's humor. He later wrote a funny and poignant obituary for Gargantua that was called, "Death of a Simian and a Scholar," which is included in The John Lardner Reader. From the column, "I saw a great deal of Gargantua. We had little to say to each other, both being of a reserved, introspective turn of mind, but whenever I watched him tear an automobile tire in two, I mused on the folly of man and his vaulting ambitions." Fantastic writing. Lardner died before I was born but his early death was a tremendous loss.